SHANGHAI - China has said that its forex reserves had shot past one trillion dollars, state television made the announcement in a brief statement quoting the State Administration of Foreign Exchange. The unprecedented financial high came as no surprise to economists and traders, who had widely estimated that Beijing's foreign reserves holdings already hit US$1 trillion dollars late last month. The nation's forex holdings reached US$987.9 billion at the end of September and have been expanding at a rate of US$18.8 billion a month this year. 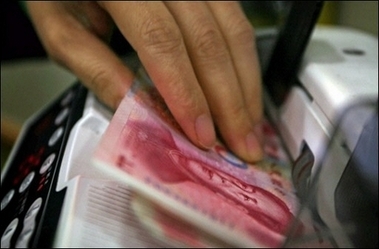 At the end of 2000, China's forex reserves stood at US$165.6 billion. At current levels, China accounts for nearly 20 percent of the world's foreign exchange with about 70 percent of its holdings in dollars, according to the latest note to clients from Brad Setser, head of research at Roubini Global Economics in New York. Like being a multi-millionaire, or in the case of China's central bank, a trillionaire, hoarding such huge amounts of money has benefits but also side-effects. Among the positives are it provides security in times of economic trouble and also helps defend against financial speculators, as many Asian countries learned the hard way during the financial crisis in 1997 and 1998. But a fast rise in forex can also over-stimulate the economy, experts warn. "It doesn't really matter how big a country's foreign reserves are because obviously the more you have the more stable you are in a crisis," said Stephen Green, a senior economist at Standard Chartered in Shanghai. "The problems come when they rise at a very fast rate. It's kind of like shooting cocaine into the veins of the economy. It's a stimulant." Amid considerable efforts to curb breakneck growth, the ballooning reserves continue to raise questions about regulators' ability to execute China's gradual currency reforms and administer effective economic policy. China's economy, the world's fourth-largest, is growing at a formidable rate. It expanded by 10.7 percent in the first three quarters, while in 2005 it grew by 10.2 percent, according to official statistics. In its latest move to cool the economy, the central bank Friday for the third time this year ordered a 0.5 percentage point hike in commercial lenders deposit reserve ratio to nine percent. China has also raised interest rates twice this year aiming to brake the surge in bank lending, already well past the US$2.5 trillion annual target.